"For the Man Who Wants to Know The Secrets of Successful Drywashing." 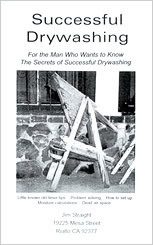 If you're into drywashing for gold, don't miss this book by expert Jim Straight. Has information that can be used with any type, style, or size drywasher. Features: old-timer tips, moisture calculations, troubleshooting, tables and charts, and more. Paperback, 5.5" x 8.5", 34 pages.